During the later part of the Old Stone Age, after the last glaciation, Northamptonshire was probably heavily wooded, especially on the valley slopes whilst the valley bottoms were swampy and largely impassable. The thickest forests were in the north-west and south-eastern parts of the county. The summits of the Northampton uplands provided the best conditions for life of early people. In the New Stone Age about 4500 years ago there were several settlements in the western half of the county along the valley slopes, but still humans had little influence on the landscape. During the Bronze Age about 4000 years ago the numbers of people in England increased who farmed using plough and oxen, and who also relied on cattle. This did not happen in significant numbers in Northamptonshire. By the Iron Age 2500 years ago, Northamptonshire was still a gloomy forested county with only a few scattered villages and rough tracks. The settlements were largely along the valley slopes of the Welland, Nene and Ouse. 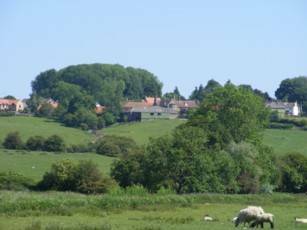 It was not until the Roman invasion in 43 AD that man had a significant influence on the landscape of Northamptonshire. For the following 400 years, the Romans were overlords of all the Celtic villages in the County. As the settlements gradually developed, the forests were reduced and the amount of cultivated land increased. A few good through roads were constructed to move food and troops, and local roads were built to collect taxes (in kind). Most settlements were along the Cherwell and Nene valleys, and the heavily wooded Northampton uplands avoided. Today, our village looks over a broad valley of trim fields. 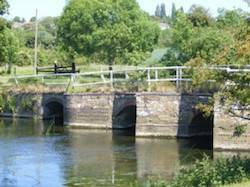 In the bottom runs the Nene, which rises from its source at Naseby and meanders through many miles of farmland to the Wash. Our river's name has varied throughout time. In 948 it was the Nyn, in 963 the Nen, in 1206 the Niene, in 1244 the Nene, in 1330 the Neene, in 1357 the Ene, and in 1702 the Nine. Fifteen hundred years ago, the Midlands were covered with great forests and dense thickets choked the swampy valleys. 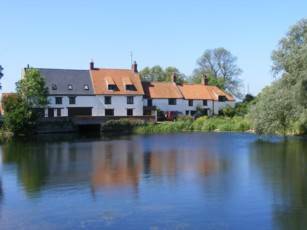 The river entered the fens by the old Roman city of Durobrivae, known now as Castor, and wandered through the swamps some thirty miles to the sea. Our river provides a watery highway from The Wash to the heart of Britain, and was used for invasion purposes by the Angles who came over the North Sea after the Roman withdrawal. Many place names originate from these times, probably between the fifth and ninth centuries. 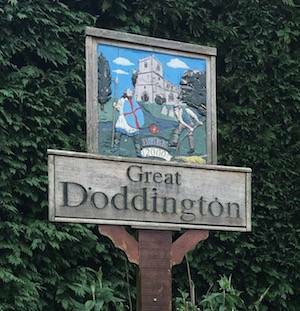 Doddington or 'Dodda's Tun' was the stockaded homestead of the people of Dodda, possibly a chief, or important man. In the Anglo-Saxon Chronicle, the death of Dodda The Ealdorman (chief magistrate of a shire or cluster of shires) is recorded in 833 - perhaps it was in his memory that our settlement was so named.